"Umami" is a term distinct with Japan. Umami means savory. Everywhere you go in Japan, be it a street food or a restaurant, you will definitely taste umami in its finest. Through the years, the Japanese developed layering its flavors. Since Buddhist people are usually vegetarians, the Japanese learned to cook without meat by enriching its flavors. Their food is umami heavy since they use a lot of soy sauce, condiments, dashi (cooking stock), and the like. While we were in Japan, we decided to focus on street food finds. We were also able to stumble upon local restaurant gems. So, what did we eat? Here is a preview. What is it? Considered to be a Japanese snack, takoyaki or octopus balls is made out of wheat flour batter with diced octopus or tako, tempura scraps, green onion, pickled ginger cooked in a special pan. The takoyaki is brushed with takoyaki sauce, sprinkled with aonori (green seaweed) and dried bonito flakes (katsuobashi). Love it or Hate it? Love it! This street food find surely hits a spot and we both wished we ate more than a dozen! It was served really hot. The sauce complements the taste of the batter itself, and its somewhat sweet. In each bite you can taste the seafood goodness of the octopus. What's not to like with that?! What? Sushi for breakfast? It doesn't sound right but while you are in Japan, eat the freshest sushi for breakfast at the market that supplies the world with high quality seafood. Tsukiji Market will soon move in a different location, so better visit now and experience the rusticness of this market. Tsukiji Market has been an icon of Tokyo tourism and has been an institution for the last 80 years. If you are an early riser, try to catch the tuna auctions at 4:00 in the morning. We just opted to eat an early morning breakfast at around 7:00 at one of the sushi restaurants. Since we only have 48 hours in Tokyo, sadly, we did not have time to wait at the world famous Sushi Dai (only seats 12, that is why the service is slow and the line is long - 3 hours won't be enough). Same is true with Sushi Daiwa, the queue was just as long. We opted to eat at Iso-sushi instead. We noticed that Japanese locals are eating there versus the other spots that is swarmed by just tourist. We trusted our instinct and waited a few minutes to get in. Lucky enough, we got really good sushi and the best value for our money, a nigiri set that only cost us $30.00. We were lucky to be seated with two Japanese women and they told us that Iso-sushi also offers specialty items, like a sushi set only for women. The nigiri set was so filling and we had the best sea urchin sushi and otoro (fattiest cut) tuna, we ever had in our life! Don't fret if you can't get in at Sushi Dai, but instead go here at Iso-sushi, you won't be disappointed. Overall, we had a great Tsukiji-shijo vibe sushi, without the wait, and they serve quality sushi with the best value for your money. We gladly took it as a win! Located at the Maranouchi area, the Imperial Palace is the home of the Imperial Family of Japan. Take a peek and stroll around the beautiful East Garden. You can also see cherry trees around the palace, stroll and enjoy the view. Everywhere in Japan, cherry trees are scattered around crowning the whole country with blossoming cherry trees, but there are some places that stands out from the rest. Ueno Park is a must-see for any visitor who wants to see sakura season in Japan. The park is so crowded and hard to take a good picture, but just enjoy the view of the cherry trees and forget the rest. The locals way of enjoying hanami - picnic at the park. I would say it is wild cherry blossoms glowing in the morning sun! Ever since we moved in South Korea, we planned to check Japan off our list. Since, its only a 2 hour flight from Incheon, we decided to see Japan in all its glory during Spring. One of the best time of the year to visit Japan is during Sakura (cherry blossoms) Season. Hanami (flower viewing) has been a Japanese tradition dating back from centuries ago. Spring brings promise of new hope and a new beginning. This season crowns the whole country with flowering pink and white cherry blossom trees. After the long, cold and dreary winter, people tend to go out and enjoy hanami. Hanami is best enjoyed picnicking under cherry blossom trees with family and friends. HOW TO GET AROUND TOKYO? We decided to purchase the JR Suica Card since the hotel we chose is just 5 minutes walking distance from Hamamatsucho Station. Hamamatsucho Station is the last station on the Haneda Express Monorail that takes you to Tokyo. This is where you also change lines to go to other neighborhoods. Hamamatsucho Station is conveniently included on the JR Yamanote Line. JR Yamanote Line (green line) loops to all the places we want to see (click here if you want to see the stops on the JR Yamanote Line). 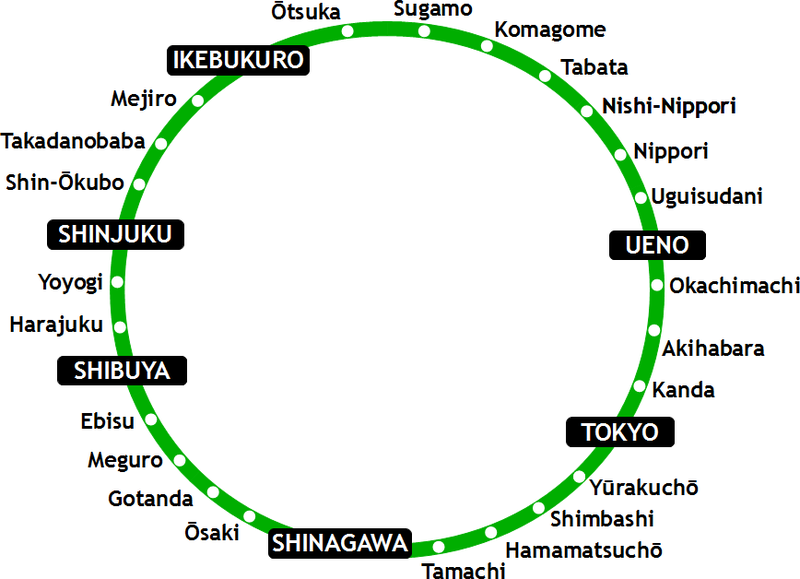 A complete circle is 35km and takes about 60 minutes while visiting 29 stations (source: Tokyo Moob).